Tropical Latin rhythms and catchy pop riffs make you dance like an animal, while learning about wild animals and how to navigate through life. 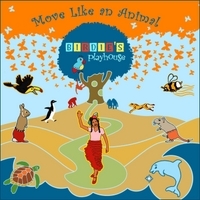 Move Like An Animal features tropical Latin beats and catchy pop refrains that will get kids to shake their tail feathers while learning about wildlife. Even discriminating growups will let the rhythm get them. In addition to being soulful and fun, this CD teaches kids about animals and helps guide them through life. The song “Chimpanzees” shows us that all creatures are equal. And “I’m a Toucan” and “Running Far” explain how to overcome obstacles and pursue your passions. Find out why gerbils are doing the "Furry Belly Dance” and what the cottontail rabbit’s best defense is! And don't miss stellar guest vocals from Mista Cookie Jar and Aaron Nigel Smith on the "Snail Cha Cha." Other featured musicians include: stunning guitarist Omar Torrez (Tom Waits 2008 tour), kindie keyboardist Mike Schmid (Miley Cyrus tour), master drummer Chris Wabich (Sheila E, Sting recordings), two-time HBO Def Poet Joe Hernández-Kolski and multi-national crooner Jonny Blu. For years Birdie performed as Michele Moreno at weddings, clubs and around the world as a back-up singer for artists including Ray Charles and Spain’s Raphael. After becoming a mom, she transformed her career to becoming an artist for kids. In 2010, she released her debut kids CD, The Wild World of Wildlife, which went on to win two of the most prestigious awards in kids music: a Gold National Parenting Publications Award (NAPPA) and a Parent’s Choice Award. She is also an accomplished actress with co-star credits on TV shows such as Parenthood, The Shield and Boston Legal.